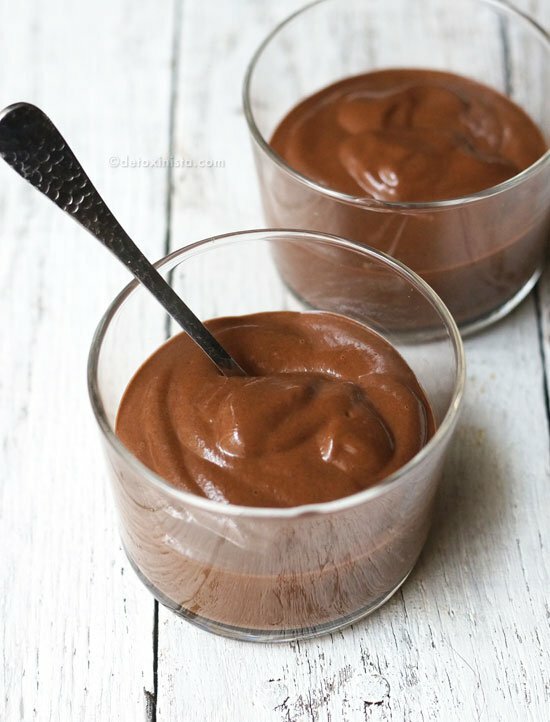 You may have already tried my chocolate avocado pudding, which is one of my favorites with frozen cherries added in, but if you’re not a fan of avocado, this pudding is for you. It’s made with chia seeds, which are loaded with antioxidants, plant-based protein, omega-3 fatty acids, and fiber. (So much fiber, in fact, that there is only one “net carb” per one-ounce serving!) And because we’ve been trying to avoid added sugars in our home lately, this pudding is sweetened with just fiber-rich dates. Now, before any of you worry about the natural sugar content found in dates, I think it’s important to note that studies have classified dates to be a low-glycemic food (source), and have found that even diabetics can consume them without significant glucose spikes (source). I personally find date-sweetened desserts to leave me feeling more balanced after I eat them, too– in other words, I can enjoy a portion, but don’t feel like binging on more sweets later! Of course, if dates aren’t convenient for you, you can always use another natural sweetener, like maple syrup or honey, if you prefer. This recipe is easily adaptable, since you can taste it as you go! Though it’s very quick to prepare, I recommend chilling this pudding completely before serving. It thickens up when chilled, and the rich chocolate flavor gets even better as it sets! Pour the pudding into two serving dishes, and place in the fridge to set until thoroughly chilled, at least 30 minutes. Serve cold and enjoy! 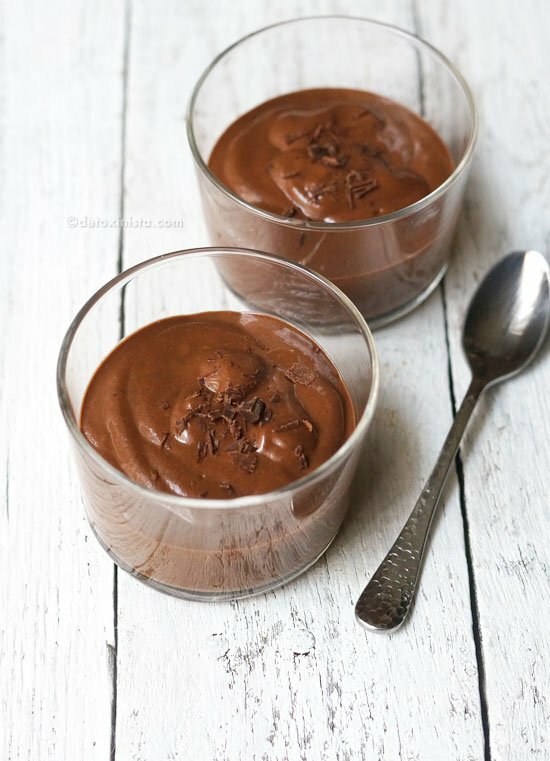 A quick and healthy chocolate pudding that is nut-free and dairy-free! If you don't have a high-speed blender, allow the ingredients sit together for 20 to 30 minutes before blending, to allow the chia seeds and dates to soften-- they'll blend much easier that way! This recipe is naturally nut-free, assuming you use water or a non-dairy milk, like rice milk or hemp milk. To replace the dates, feel free to use 2 tablespoons of maple syrup or honey. Reader Feedback: Have you been afraid to consume dates due to their sugar content? If so, I hope you’re more willing to give them a shot now! Delicious! I doubled the recipie and used a full can of reduced fat coconut milk, added a hint of cinnamon too. Dates are amazing, thank you! I just made this recipe. I love It! I actually enjoy the chia seed texture, so I wasn’t worried about blending it smooth, just mixed and the date broke down. I chopped up 2 figs and a tbs or so of almonds and added them on top. It was so good. Reminded me of Rocky Road ice cream. I absolutely LOVE this recipe and always double it, and this week added 1 Tblsp. of raw cacoa nibs and just when I thought it could not get any better it did! Thank you for the amazing recipes! Yum. I added a teaspoon of honey for the pudding for my son. I added cayenne pepper to mine because I love dark chocolate and chilli. Will be making this again. Thanks for sharing. Incredibly tastey – made it with coconut cream and 5 dates and even my daughter loved it . Thanks for a fabulous dessert pudding . I used the Ninja and had no problems whatsoever. I LOVE this recipe! It tastes just like a regular chocolate pudding. I just tried an experiment to make lemon chia pudding based off of this recipe and it worked wonderfully! I used 1/4 cup Meyer lemon juice and the zest, 1/2 cup soy milk, 60 g medjool dates (about 3 large), 2 tbsp chia seeds, and vanilla bean paste. The lemon flavor is strong enough that you don’t taste the chia seeds at all and it tastes comparable to a rich cashew-based pudding. So creamy and delicious! Thanks for the recipe! I love lemon desserts! Thank you for sharing. I’ll have to try that soon! 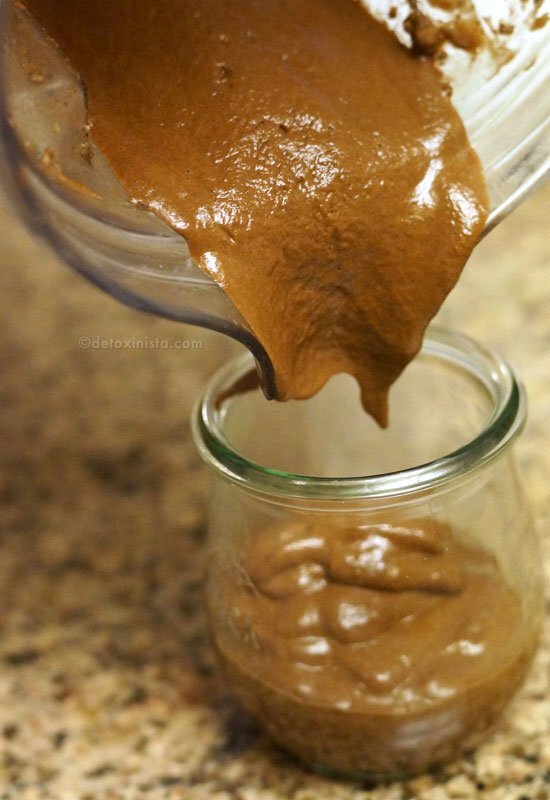 I don’t think you’d notice the flavor of the nut butter if you totally blend it with the other ingredients, but maybe you could “swirl” it in at the end? I think that sounds good! What a great idea to crush the Chia seeds in a high speed blender! That’s the way I really like Chia pudding. Next time I’ll try a banana instead of dates, I am sure that this is also very tasty! Thank you so much for sharing the recipe! This is by far my new favorite snack/desert/breakfast! I threw in some nut butter and it was so tasty! This was delicious! And I love desserts where I don’t have to cook anything – especially in summer. I decided to try adapting this to a butterscotch flavor tonight with the following changes: omit cacao powder, doubled rest of ingredients, added 1 tablespoon almond butter, pinch of salt, teaspoon bourbon vanilla extract, reduced coconut milk by a couple tablespoons. Turned out pretty good. I threw this in my Popsicle mold to make fudgcicles… And I’m telling you. It’s a close rival to your avacado based Fudgesicles! So good! I hope you try it. 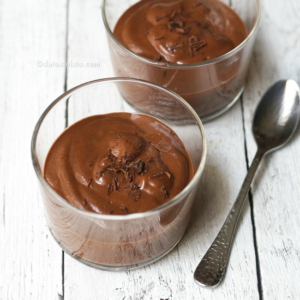 This pudding recipe is really versatile!! The fructose in fruit is very different from the fructose used in lab studies. (To isolate the fructose for research, they must use man-made fructose such as table sugar or HFCS.) Research that looks at dates, rather than just isolated fructose, have shown HUGE benefits to including them in your diet, including benefits for diabetic patients, those trying to improve fertility, and amazing benefits for pregnant women. I aim to eat 4-6 dates a day, and I have less sugar cravings than ever and all of my blood work has improved. Thank you for your reply, Megan!! There are lots of conflicting articles out there, confusing everyone including myself! I get my dates back in my diet! Thanks again! made this on a whim and was surprised how good it was! I let the dates sit out of the fridge for about an hour or so and soaked them before mixing them with the other ingredients in my nutribullet. i did add a tablespoon of honey and it is so delicious! a must try. Hmm… I’ve never tried that so I can’t say for sure. It’s probably worth a shot! This is the best chai pudding I’ve tried! I’ve tried this over and over again and can’t get rid of the bitter taste. I guess it’s the chia seeds. What should I do? It would be the cocoa powder try adding some more dates or sweetener in. I’ve made this pudding twice now. The first time I made it exactly as described and both my husband and I had a taste. We both agreed it needed a little honey (perhaps we have more of a sweet tooth than we thought!) I made this again last night and again added honey, and then, to make it even more decadent, added a tablespoon of all natural peanut butter. I put both bowls of pudding in the freezer to get them nice and cold, which made this almost like ice cream! I wasn’t able to get the consistency/texture quite as smooth as the pictures show, but that might be because my blender is on its last leg. Regardless, this recipe is super quick and easy and has a nice rich flavor. If you are using a nutribullet (like moi), I recommend doing the extra step where you soak all the ingredients together for at least 30 minutes. My little blender wasn’t quite up to blending the chewy dates and crunchy little seeds very well so next time I’ll take that precaution. Also had to add extra date, cocoa and vanilla to really combat that oily/flaxy chia taste (am I the only one that loathes it?). I made this pudding tonight and it was delicious. Although I like the texture of unblended chia seed pudding this blended recipe is better. I will definitely make it again. Oh my God! This is so delish! Just made this and it’s absolutely yummy! I had delget dates, not sure if they are less sweet than the ones in the recipe, but thry are perfect! I put it all into my nutribullet and it was whipped up in no time. It’s in the fridge now chilling for af ter dinner. this is my first recipe I’ve made from the site and I’m looking forward to making more. I’ve recently changed eating habits and it’s sites like these that make the change less confusing and much easier. Thank you thank you thank you! I just made this and although I love all the ingredients independent, as a pudding it had a very strange taste. One son and my husband liked it and one son and myself didn’t. It had such an off flavor that I’m guessing was the chia seeds. My friend made it also and had same thoughts. Just made this and its yummy! I used coconut milk and added an extra tablespoon of cocoa to a doubled recipe. I made it with my food processor because my nutribullet can’t handle the dates unless they’re pre soaked. I may try soaking the dates and chia seeds in the coconut milk overnight before I make next time. What I love about making vegan desserts is it’s always safe to lick the bowl! Ohh this looks delicious, I can’t wait to make it! I’ve stayed away from chia seed puddings in the past because I didn’t love the texture, but love that this is blended! And that it uses dates as a sweetener because I’m off of all refined sugars right now! Never thought to blend a chia pudding after letting it set to make it smooth! And ugh— I hear all the time from clients “grapes are too high in sugar” or “bananas spike my blood sugar!” And yet they will still eat an Oreo! It’s just an excuse to not eat fruits in my opinion. I love chia seeds and have been wanting to try a pudding for a long time now, but all the recipes I’ve seen look like lumpy tapioca-type puddings- what a good (and probably obvious) idea to put it in the blender! Thanks for the recipe! Made this last night! Was delicious! Thanks. Made this last night. It amazes me how something so easy and healthy is as good or better than any pudding I’ve ever had. My kids loved it! Good to know about the dates. They are my favorite sweetener. Made this today and served it up with fresh strawberries. Its been forever since I had a good chocolate pudding! Kids ate it up and asked for more. Thanks for another great recipe Megan! I just made this with maple syrup as I did not have dates at hand – it was GREAT! I also added some dark chocolate to have that “chocolate chip” texture. Growing up, i loved snack pack but now that i know what’s in that thing, I could never have that again although i did miss the texture and taste of it from time to time. THANK YOU for the recipe – it was great! I was wondering how you got it to look so creamy. I do not like the seedy, grainy texture of some chia pudding recipes. This sounds fabulous and looks decadent. yes, I used almond milk…it was yummy! I love dates, but they are so loaded with sugar that whenever I eat them I start shaking. Whenever I eat too much of any sugar…ore than 10 g at a time, I get a major reaction. Because dates are so loaded with sugar they always cause quite a big reaction. No dates for me. I stick to using bananas to sweeten things, and stevia too. Wow! that looks so good and I have everything to hand. I eat dates in moderation because they are loaded with fiber and promote healthy bowel movement. I just made it and it was amazing! It’s the best chocolate pudding I have eaten. And yes, the chia seeds disappear after blending. Thanks for the recipe! Absolutely, I’ve avoided medjool dates because I thought they were loaded in sugar and would just cause me problems (I’m hypergycemic). When I consume too much sugar, I feel dizzy and like I’m going to faint. Not good! Tried various spins on puddings with the avocado’s but I can’t warm to them. Love how this chocolate pudding leaves them out! So eager to try and with the medjool dates ~ I’m getting over my fear that it will spike my blood sugar. Thanks! Fibre and fat curb the insulin spike induced by high-glycemic/sugar foods. If you eat an apple by itself, for example, your blood sugar would rise more than if you ate that same apple with a few spoonfuls of nut butter. It may seem counter-intuitive, but this is the reason behind the notion that eating a croissant is better than eating a piece of plain, white bread for blood sugar. The fat in the former curbs the insulin spike more than in the latter, which has no fat (or fibre). ONLY if you’re Type 2! That is really helpful to know – I was not sure about the sugar content of dates but had never bothered to research it – thanks for saving me a job:) This looks lovely – does the bits of chia seed disappear after blending?